Soundtrack to The Legend of Charlie Birger. Featuring caustic acoustic sounds of yesterday and beyond. "I've Killed Men" was used for the Soundtrack to Carbondale, Ill., public television station WSIU-produced documentary "The Legend of Charlie Birger," a 1920s gangster and bootlegger in Southern Illinois who became the last man publicly hanged in the state. Songs about prohibition era partying and bloodshed. From the village of Makanda in extreme southern Illinois, in a little hollow called Vulture Valley, comes a "caustic acoustic cacophony" known as the Woodbox Gang. They have skillfully combined the American roots music styles of bluegrass, delta blues, folk, and traditional country with the aggressive delivery of punk rock to create their own style of music to which they have given the name "Trashcan Americana". The band is very interested in experimenting with the combined sounds of various conventional and non-conventional instrumentation to create sonic landscapes specifically tailored to the mood and theme of each composition. Hugh DeNeal, their chief lyricist, uses his poetic talents to craft twisted tales of a dark, yet often humorous nature. The Woodbox Gang specializes in "story telling" songs. The group has shared the stage with artists such as Hank Williams III, the John Cowan Band, & many others. 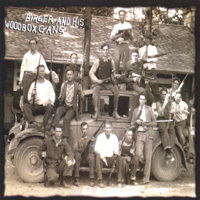 Alternative country icon Jason Ringenberg (Jason and the Scorchers) has been quoted in several interviews citing the Woodbox Gang as one of his favorite new bands. The Woodbox Gang's influences are as diverse as the music which they perform. The group admires artists such as Tom Waits, Johnny Cash, Bob Dylan, and the Ramones for their enduring inventiveness and their courage to "do their own thing, regardless of what anyone else may or may not be doing." The band's multi-instrumentalist Alex Kirt says "We are influenced by everything we've heard, whether it's a symphony orchestra or a push rod knockin' in an old 350 engine. Just about anything that makes a sound can be used to enhance the mood of a tune." This idea can be heard on any one of the group's officially released 4 studio albums & 2 live albums on which they've used traditional guitar, mandolin, lap steel, banjo, fiddle, and bass combined with didjeridoos, kazoos, sawblades, gutbuckets, crowbars, ashtrays, and rusty gasoline cans to add brilliant audio hues their musical palette. Great! Better than Trashcan Americana, awesome. Good band. I will look forward to listening to some more of your work. Thanks and Godbless. Not my favorite WBG album, but a solid collection of music. I have bought 3 out of 6 cd's from the Woodbox Gang. I thought the 1st was great but as I get each CD they are all fantastic. You never know what to expect and I love that. Thumbs up !!!!! Heard them on WDBX, saw them in Makanda last week, now just gotta get some on cd!! Love em'!! More beautiful music here. Every song on the cd is a good one....as usual! They are very addictive!